There's something about chickens that make me very happy. As you know, ours free-range with impunity and at their peril. But they are so care-free, happy and busy all day. They are a cure for a bad day or a stressful situation! They come running as soon as they see us and are not afriad of Burt. Come to think of it, they are among the many things for which I am grateful. I live in a magical place. There are of course my domesticated animals. Chickens, horses, cows and dog. 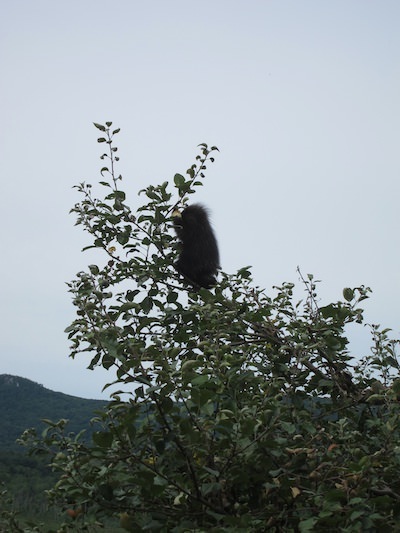 But the wildlife seems to like life at Boulderwood as much as the rest of us. 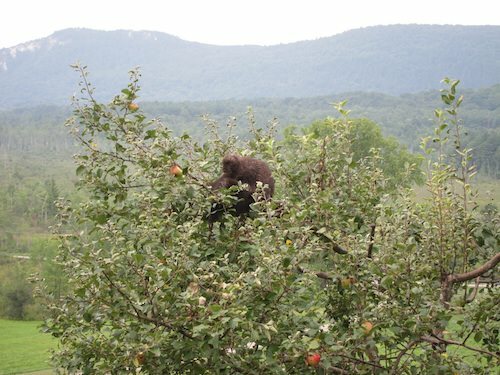 Over the last 2 days a Mommy porcupine and baby have been having a picnic in one of our apple trees. In fact, we even witnessed the baby nursing. The baby has been hanging out by herself for the last 24 hours in the top of the tree. 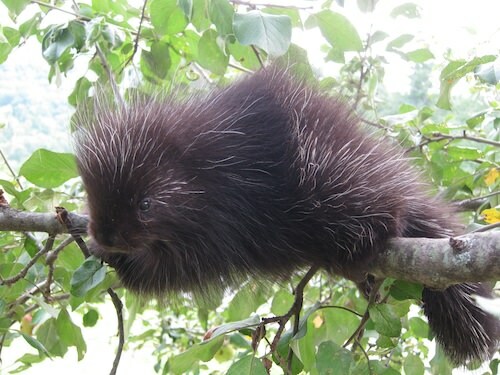 A question from one of my friends was: Are baby porcupines born with quills? To which I answered, let's Google it. According to Wikipedia, they are born "with soft quills that harden within a few hours after birth." Isn't nature grand? 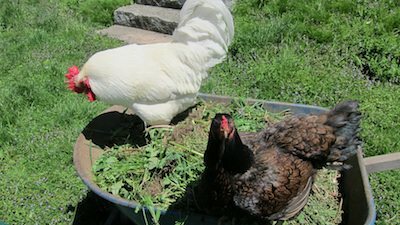 Our girls are old and their egg-laying has tapered off quite a bit. So, I bit the bullet and ordered the "rarest of rare" mix of chicks from Murray McMurray Hatchery. I was expecting them tomorrow but I received a call from the kindest person from the Pittsfield Post Office. She said they'd be at Stockbridge tomorrow but if I wanted to pick them up today, she would wait for me to come get them. All I needed to do was call her cell when I was outside the PO. Her kindness resonated with me. 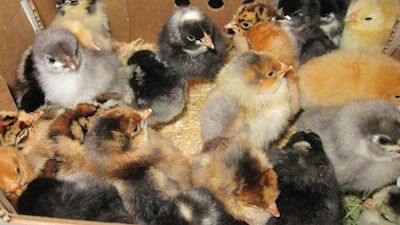 I jumped in the truck with Mia and headed up to Pittsfield and now the adorable balls of fluff are peeping happily in my kitchen..AHHHHH...the wonders of farming life!! 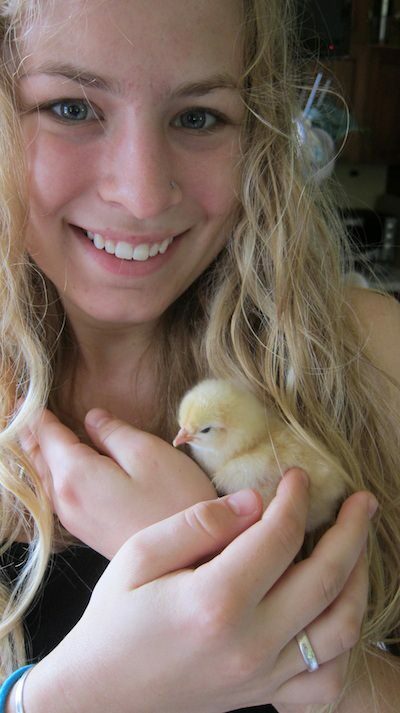 And Becky Narum couldn't resist picking up and loving one of the chicks. Love at first sight!! We've added a second garden so we can grow lots of food to eat now and to put up for the winter. Jim was aided by one of the chickens. I just love the chickens. They crack me up with their antics!! 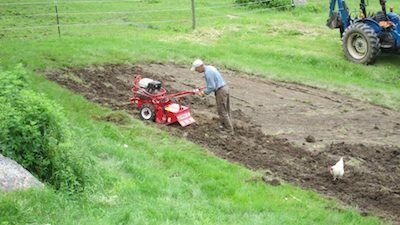 Who needs a rototiller when you have chicken? I love Burtee so much. He's such a loyal and loving dog. 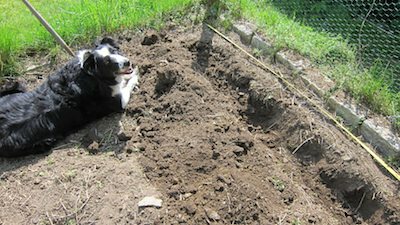 He rarely leaves my side and is right there in my garden as a prepare to plant. Who else's dog loves to hang out in the garden? 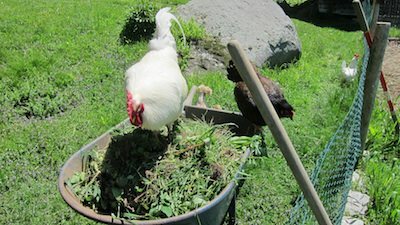 The chickens were dying to get into the garden to peck around but were just as happy with our wheelbarrow full of weeds and bugs. Chickens really make me smile. Their antics are so entertaining.